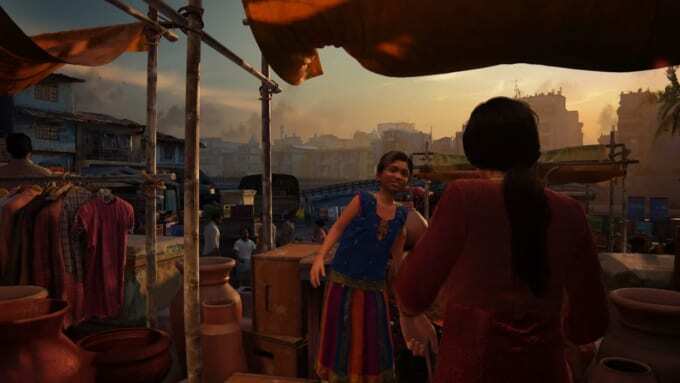 This page contains a walkthrough for Chapter 1 – The Insurgency for Uncharted: The Lost Legacy, including main story objectives, obtainable weapons., equipment and items, and characters and enemies encountered in the game. After watching the opening cutscenes, you will gain control of Chloe at the market. 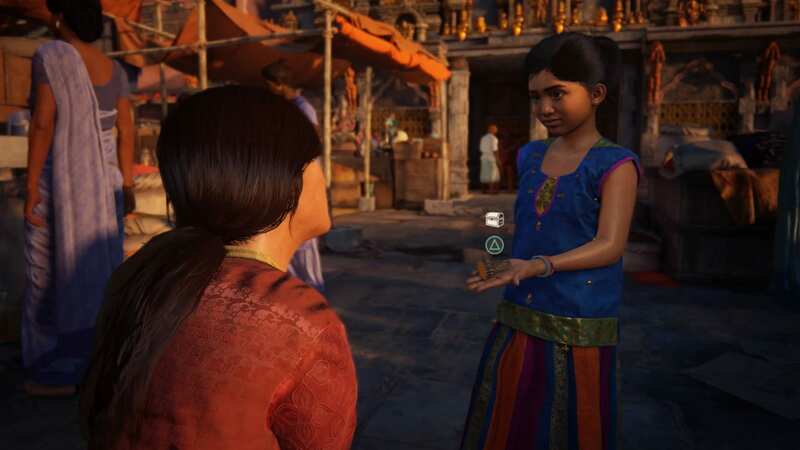 The first chapter of the game serves as a tutorial of the Uncharted: The Lost Legacy’s basic game mechanics, as well as teaching the player to control Chloe. Follow Meenu through the streets until you arrive at the truck. You won’t be able to jump on the truck with a soldier guarding it, but Meenu will help you out. Carefully sneak past the soldier when Meenu keeps the soldier busy. You will then travel along the truck unnoticed. When it stops to the destination, you will need to get to a location marked by a red door (shown on Chloe’s phone). Proceed along the hall and down some small steps. Then, make your way to the right. From there, just follow the path straight until you come up to the street where a car will zip past. There will be some rebels who’ve captured a civilian. Afterwards, head for the opposite side of the street (from the rebel car, just turn around and head straight). At the opposite end is a checkpoint manned by more rebels for a cutscene. Afterwards, proceed on the same path forward again. You’ll get a view of the red door as you pass by the fenced area with the van that’s shining the light on the street. From there, follow the street until you come up to a dead end. There will be a narrow space to the left that’s partially covered by a big cloth that you can enter. The fence under it is open so you can squeeze through. Once you enter the fenced area, turn at the corner on the right. Proceed and take cover from the two rebel guards talking up ahead. Remain hidden until they part ways (one of them will leave, while the other will walk towards where you are hidden). Carefully wait for the opportunity to take out the guard by doing a stealth attack (press the square button) from where you are hidden. Then, hop to the other side and proceed forward. The other guard will be standing with his back turned on the corner on the left. Take him out as well and move forward. Squeeze under the narrow path and head for the red door just up ahead. You will need to pick the lock to get in. Listen to where the lock vibrates. You’ll know where to pick when the lock’s symbol faintly lights up in a pale green. Once inside, a cutscene will play. Afterwards, proceed forward (ignore the wreckage that goes into the water). Then, go up the upper level by climbing up the wreckage on the right. “Push forward” (with the x button) and make your way up the wreckage. To get to the upper floor, you’ll need to grab on the broken patch of concrete above (where some wooden boards will be exposed). As you come up to the upper level, stay on the alert and avoid being detected. From where you came up from the ledge, turn left and go inside the room with the big wreckage at the entrance. You will overhear two rebels talking. Ignore the rebel on the left side (from a hole in the wall where you can see the red orange corridor). Instead, head for the lone rebel on the right who will stop by the window. Take him out with a stealth takedown. Afterwards, climb out of the window and make your way across the ledge and up the metal ladder. You will arrive at the rooftop where some of the laundry are hanged out to dry. Proceed forward towards the clothelines and get a view of the city. Then, head up another ladder on the left and get on the higher platform. Then, drop down on the next area across. Get ready to engage a group of rebels there. Luckily, you will be joined by Nadine to take out the rebels. This concludes the walkthrough for Chapter 1 – The Insurgency for Uncharted: The Lost Legacy.